Funnyman Rich Vos brings humor, tales of New Jersey upbringing to Revel’s new comedy series. Whether it’s on stage as a contestant on NBC’s Last Comic Standing, chiming in on satellite radio’s “The Opie and Anthony Show,” or stepping up to the mic on The Jimmy Kimmel Show, chances are you’re familiar with Rich Vos’ brash and painfully honest stand-up comedy. The Plainfield native visits Revel on Feb. 13 as part of its new Thursday night Comedy Social series. Here, Vos tells us about life on stage, doing a podcast with his wife (fellow comedian Bonnie McFarlane) and what comedy means to him. 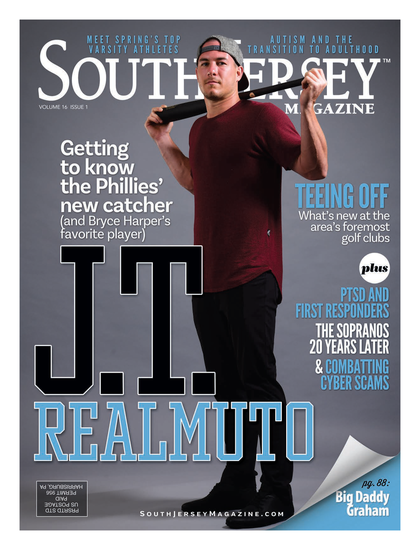 SOUTH JERSEY MAGAZINE: You’re known for your stand-up, but you’ve transitioned to television and have written for award shows and the Comedy Central Roasts. What is it that keeps you coming back to the stage? RICH VOS: Standup is my passion I love doing it. The traveling part stinks, but the good thing is that I get to play golf everywhere I go. When you’re a standup comedian, everything else you do, like T.V. and radio, is a bonus. SJM: How has your stand up routine changed over the years? RV: Everything evolves with time. It’s more mature and more personal. As you grow as a person you grow as a comic and in everything you do. If you don’t progress then you’re doing something wrong. All I have to do is see what’s going on in the world and address that in my own voice. There’s always something going on, and that’s what makes it original. Right now there’s 10 million people talking about Chris Christie, but I’ve got to figure out how I’m going to talk about it, how I’m going to use my own voice to make it original. SJM: How has comedy as a whole changed over the last decade? RV: The good always survives, and there’s always a new type of genre to talk about. Now there is a lot more of alternative comedy, not just traditional style. There’s so many more opportunities now than there were before: There’s a million more television stations and of course the podcasts. RV: We were talked into it—we originally said we would never do a podcast. But we just started talking and seeing what was going on in our lives. No one has a podcast like ours. We’re husband and wife—one second we’re getting along and the next second we’re arguing. It’s become another aspect of our relationship. SJM: Why do you think podcasts have become so popular, specifically for comedians, in the last few years? RV: Podcasts are great. You can do your own thing and no one can control that. There’s so many of them out there and there’s so many of my friends with their own podcasts that it’s hard to keep up with and follow sometimes. SJM: I know you made a documentary about women in comedy alongside your wife, who is also a comedian. Is sexism in comedy still an issue? RV: Not for me it’s not! But really, there’s sexism in every business, just as there is racism and homophobia and anti-Semitism. It’s a part of being different in the world. But female comics are exploding right now; they’re all over the place. Sarah [Silverman], Amy [Poehler], Ellen [Degeneres], Chelsea [Handler], my wife. I could keep going. And lately, it’s not about male or female, it’s about how many tickets you can sell. It’s a big business. They’re all about selling tickets, and women are selling tickets. SJM: What was the response you got from the film? RV: We haven’t been able to view it to the public yet, but we showed it at a couple of festivals and it killed at all three. This isn’t a high Hollywood budget film, we produced it and directed it with 25 other major comedians. It has done well wherever it’s been shown, and once we get it through the legal stuff we can get it out there for everyone to see, hopefully in the next few months. We’ve been on this project for over five years. It’s the first movie that we’ve made and we just want to really make it the best product that’s possible. RV: In general, most people aren’t funny. I don’t want to be Nicky Negative, but to me Colin Quinn is funny, Patrice O’Neal—who passed away—is funny, my wife Bonnie is funny. I see a lot of great comics, but my personal preference is someone who really pushes the envelope. SJM: What’s life like for a comedy couple? RV: The only thing different is that both make people laugh for a living. Date night for us is going to a show, doing an open mic or something. It’s hard when you’re in this business to have a life outside of it. Hanging out with comics for us is great, but I guess that’s what computer programmers say when a bunch of computer programmers are hanging out too. SJM: You’re obviously busy travelling all over the place with your act, but as a Jersey native do you have anything special planned for A.C.? RV: I hope to bring a lucky streak and shoot craps and win a little money.